Being a Silicon Valley native (my dad was a Fairchild Semiconductor engineer) I grew up playing with punch cards and microchips. I've always loved art and science and believe the two complement each other. I entered the computer graphic industry at its inception (see me & IBM 386 PC!) producing chart and graphs slides on the Stanford campus. When the color Mac was released, I worked as a User Interface Designer for SuperMac Technology on Pixel Paint Professional and Premiere at the dawn of the digital video industry. Next, at Clement Mok designs, I developed the Aaron 3D navigable chair, and the first Star Wars website for the newly emerging Internet. 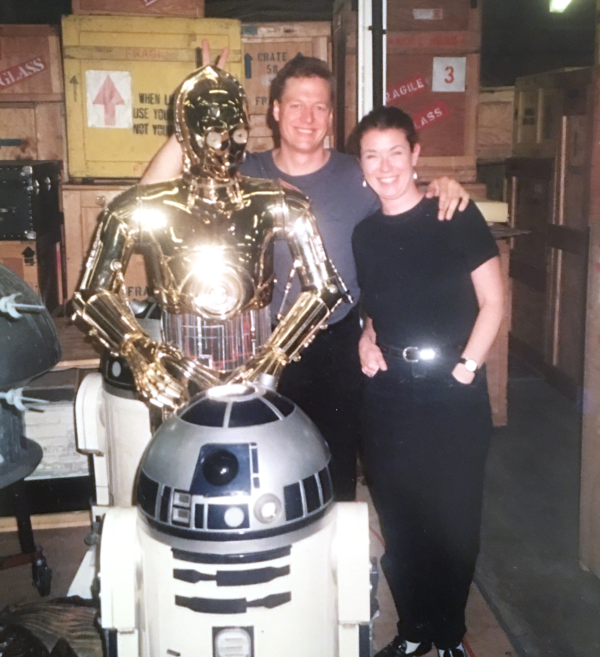 At the LucasFilm prop warehouse (below), I caught the entertainment bug and moved to LA and started my own agency Click Media. Over the course of 15 years my team and I worked on thousands of amazing websites and games ranging from X-files, to Shrek, to Harry Potter and hundreds of incredible entertainment brands. Moving back to NoCal I worked at eBay on shopping and search UI, and then Blurb, where I conceived and developed a mixed-media storytelling app. Now, at Google Analytics, I work on numerous products where my love for design and science continues to be satiated. I live in Menlo Park with my son, and daughter, and Boxer Ali.